I can't believe it's already the end of January! 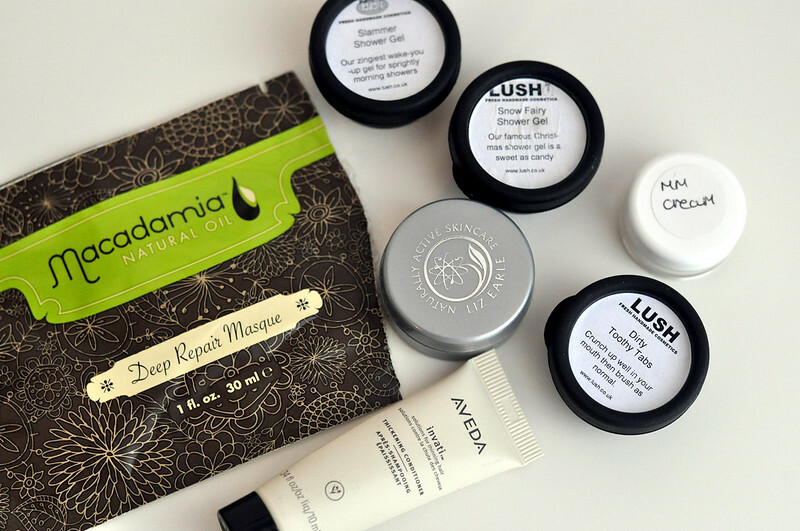 I've actually managed to use up quite a few products this month compared to Decembers blog post. I also went through my eye make-up products the other day and had a bit of a clear out. Nspa Passion Fruit And Grapefruit Shower Gels - I really like Nspa as a brand, their products smell amazing and work well. These two are no exceptions and are a cheaper version of The Body Shop shower gels. Once I'm off my no buy then I'm sure I'll pick up some more of these. They're usually on offer for 2 for £4 in Asda. Original Source Orange And Cinnamon Shower Gel - Original Source is another brand that does shower gel very well. I liked the scent of this one but I wouldn't buy it again. Nspa Jojoba And White Jasmine Shower Gel - This is my favourite scent for body products and I've tried nearly everything from this line. I think this is my second tube and I'll definitely be buying a third at some point. Soap And Glory Some Like It Hot Body Scrub - This is one of my favourite body scrubs and I wrote a full review of it here. I have bought a Nspa version to see how it compares but I think it wont be as good. I'll be repurchasing this again once I've used up all my other body scrubs. Ritessens Face Exfoliant - I really wasn't a fan of this product and haven't even managed to finish it. The Liz Earle muslin cloths are more exfoliating than this and I didn't like the cleanser part of it either. I'm not a fan of the scent as well. Espa Energising Shower Gel* - I finished a tube of this last month as well and my opinion is still the same. I love it but it's very expensive. I'll probably buy a tube at some point but only as a treat. Liz Earle Energising Body Scrub* - I used this last night in combination with the Espa shower gel and they worked really well together, they have similar scents. The beads in this scrub are suspended in a gel which lathers up very well. I'm sure I'll buy a full sized tube at some point. Liz Earle Hand Repair* - This is one of my favourite hand creams and I've kept this in my bag this month. I don't need to worry about finishing this tube as I already have the full size on my bed side table. I love the scent, how it makes my hands feel and how quickly it sinks into the skin. Macadamia Deep Repair Masque - I really liked using this hair mask and can totally see why there is such a hype around it. I got about 3 uses out of this sachet and it made my hair feel amazing. I'm itching to buy the full sized tub but since I'm on my spending ban it'll have to wait. Lush Slammer Shower Gel - I love this fruity shower gel and luckily I already had the full size of it. Lush Snow Fairy Shower Gel - Another Lush shower gel that I love! I bought a couple of bottles in the sale to last me through the year until it's on sale again. Liz Earle Super Balm - I think this is my second tub of the stuff and I love it. I use it as a hand and cuticle treatment over night and it works wonders. I already have another tub from my Liz Earle advent calender so don't need to buy a new one right away. Origins Mega Mushroom Cream - I loved this moisturiser and I got so many uses out of this sample I could properly test it out. I want to use up a couple more moisturisers before I buy the full size of this though. Lush Dirty Toothy Tabs - I hated this and even made my parents give it a go. You're meant to use them instead of toothpaste but I didn't like the texture. Aveda Thickening Conditioner - I didn't rate this conditioner and felt it wasn't moisturising enough. My hair doesn't need thickening but I just wanted to use up the sample. Studio Make-up Felt Tip Liner - As far as felt tip eye liners go I did like this one but I just don't use it enough. I have quite small eyes so I just don't think liquid eye liner suits me so I wont buy it again. Daniel Sandler Baby Jet Mascara - This is a very good bottom lash mascara but just isn't as good as the Clinique version. 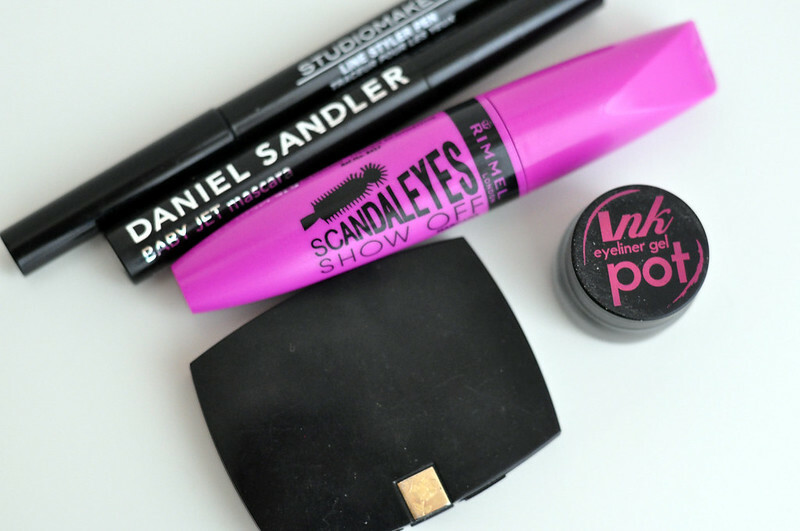 Rimmel Scandal Eyes Mascara* - I really hated this mascara and that doesn't happen too often for me. It was extremely dry so I couldn't really coat my lashes. It's also full of little fibers which I found irritated my eyes. Lancome Eye Shadow Palette - I bought this palette when I was in New York which was around 4 years ago and I've only just managed to finish it. I loved the colours in it but I can probably find the same colours in other palettes I have. Sleek Gel Eye Liner - This is the same as the Studio Make-up eyeliner, I just don't use it enough so it's actually dried up. It was a nice liner but didn't wow me. I much prefer pencil liners. Wow you've finished so much! I've actually managed to get through a few makeup items this month! I need to do a new empties post! 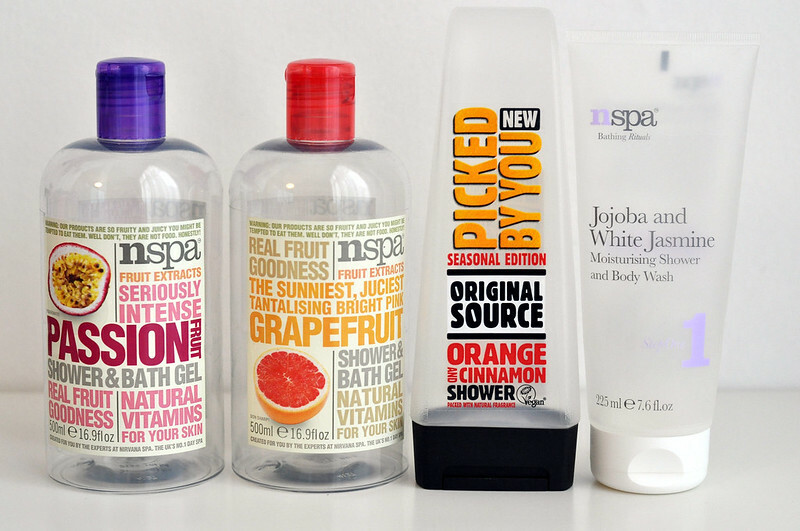 Those Nspa Shower Gels sounds great.I love the packaging - 2 for £4 is a complete bargain. I will be picking a couple of these up for sure. I need to go through my eye makeup and have a good old clear out. Its amazing how long you hold on to things. 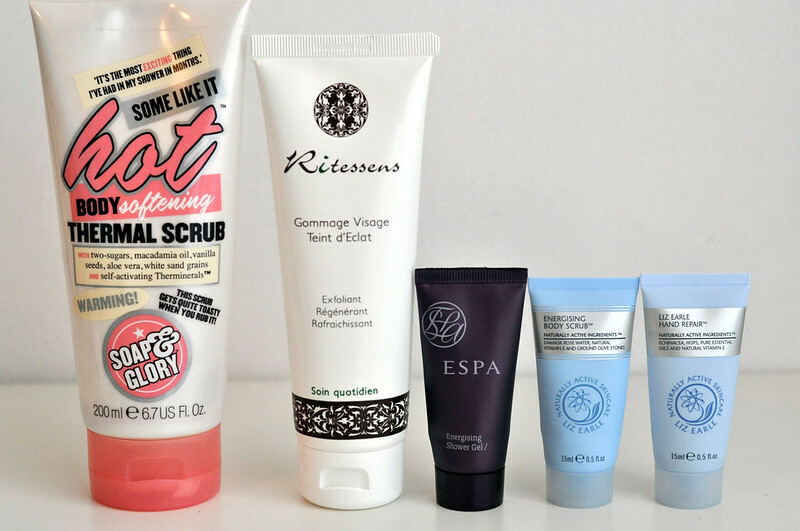 I have never tried the Thermal Scrub but I love scrubs & any excuse to try something new from S&G.